I love broccoli rabe (which also goes by the name “rapini”) a whole heck of a lot. It’s a bitter green so if you’re scared off by bitterness, this might not be the vegetable for you. But if you embrace bitterness, like I do, well, I think you’ve found yourself a new vegetable to love. When I start to see it in the spring markets, I buy it weekly, usually cooking it up with sausage and pasta for a nice easy dinner. But when I was flipping through The Smitten Kitchen Cookbook, I discovered a new way to love my favorite vegetable. Enter the broccoli rabe panini. This is a great recipe to make for a casual dinner party because you can prep all of the ingredients beforehand and then put the sandwiches together at the last minute. Rinse and primp the broccoli rabe – I use the leaves, stems and all. But you might want to trim away some of the larger stems, but I usually don’t bother. Make the caramelized onions and then saute the greens. When it’s time to eat, just assemble and press your sandwiches! It’s a party win! Plus, if you don’t have a panini press, you can entertain your guests with your goofy cast iron skillet + tea kettle combo press! Let the good times roll! My homemade press worked like a charm. I got grill marks that look totally pro and my sandwich was crispy, gooey and hella delicious. The sandwiches are pretty filling so you can save half for lunch the next day to heat up in the oven. Yum. Besides the ingredients below, you’ll need a panini press. What? Don’t have one? Don’t fret, I don’t either (see photos above). In that case, you’ll need a grill pan (ideal) or a large cast iron skillet along with another heavy cast iron skillet + a kettle (again, see photos above for illustration). Panini press hack!! In a large bowl, filled with water, let the broccoli rabe soak, removing any sorry looking leaves & discarding the heaviest stems. If there are any large florets, halve them. Rinse and shake dry, set aside. In a large skillet, heat olive oil over medium heat and add in the onions, stirring occasionally. After 5 minutes, stir in the balsamic vinegar and let simmer until soft and caramelized, about 15 minutes. Remove onions from pan and set aside. Add in the garlic and broccoli rabe to the same pan, along with the red pepper flakes, adding in the veggie stock. Cover pan and let saute for 5-10 minutes until greens are bright and tender, tossing occasionally, until the stock evaporates. Season with salt and pepper and set mixture aside. If you have a panini press, you’re golden. If you’re like me, use a heavy cast iron grill pan and heat over medium heat. Lightly brush the outsides of the ciabatta buns with olive oil. Put one slice of bread, olive oil side down on the hot grill pan and spread a spoonful of the caramelized onion mixture, topping with the broccoli rabe. Top with a couple slices of the fresh mozzarella and top with the other half of the bread, olive oil side up. 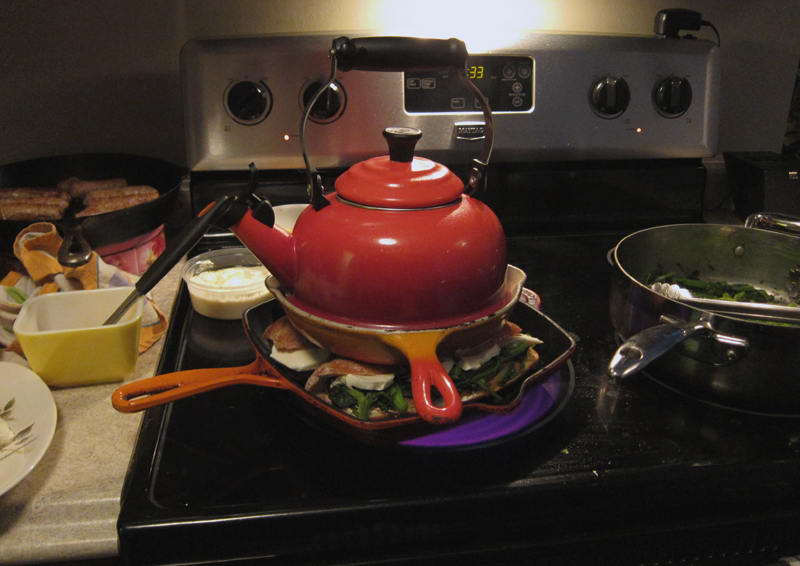 My pan is large enough to do 2 sandwiches at a time. If you have a panini press, press it! If you don’t (like me), use a heavy skillet + a tea kettle half filled with water and place on top of the sandwich to weight it down. After 4 minutes or so, remove the kettle and skillet, carefully, and flip the sandwich. Load up with the skillet and kettle again for another 2-3 minutes until toasty and the cheese has melted. Repeat until you’ve grilled all the sandwiches. Cut sandwiches in half and eat while hot. Makes 4 large sandwiches which can feed 4-8 people. 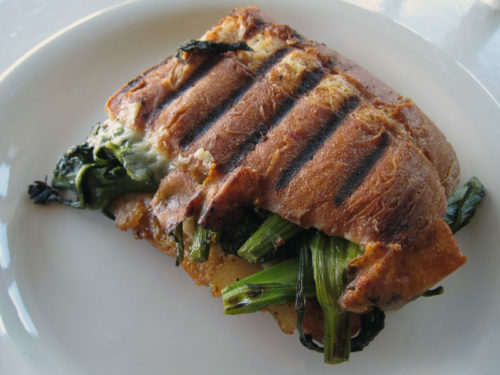 Mmm broccoli rabe is one of my favorites and I especially love it paired with melty cheese! Great sandwiches! Hmm I don’t have a panini press and love this idea, thanks! Crispy bread, with gooey cheese and something bitter or sweet or both is a recipe for sandwich heaven. 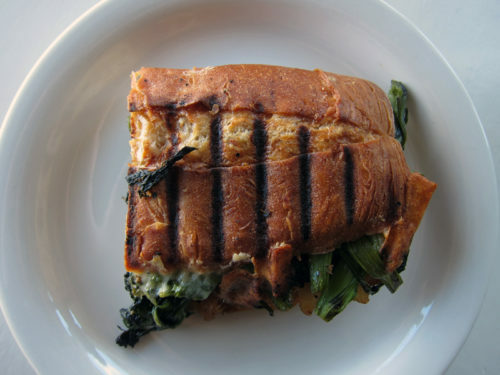 ergo, this sandwich = heaven. is it just me, or does EVERY SINGLE RECIPE in the smitten kitchen cookbook seem like a winner?! this one included! good show! Thanks Flora, the press works wonderfully, thank you! Bijoux, I never thought about it either. It works incredibly well! Thank you, Sarah! It is heavenly! Alana, I’ve made 2 recipes from the book so far, and both were delicious! It’s a great book. Love the “panini press” – those sandwiches look pressed to perfection! I love the sound of this sandwich! It looks really flavorful. I was just thinking I need to get myself some broccoli rabe while it’s around. 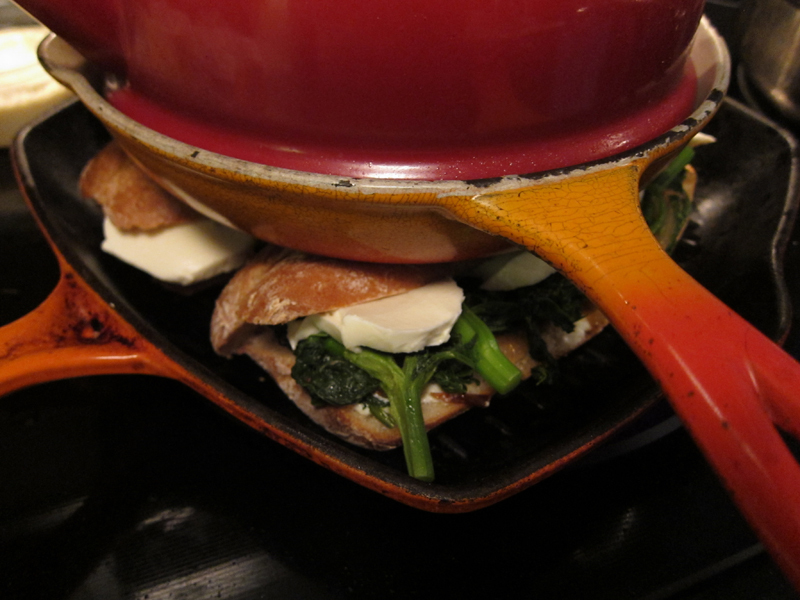 Your panini press hack is great! I like the idea of a panini party, too. You’re the party idea queen lately! Ha, as soon as I saw the picture and title I said to myself ‘That’s in the Smitten Kitchen book!’ 🙂 It’s one of the her recipes that I haven’t made yet, but I’m dying to try. You’ve just given me the motivation! Thanks Jess! It worked out really well. Christy, it’s a great one! I hope you give it a go.